Richie Ryan dominated Race 1 taking the win from Luke Johnston and Peter Moloney by a large margin. Race 2 saw Richie Ryan do the double after a fierce charge from Brian McCormack. In the end however, it was Peter Moloney that took 2nd place from Charles Stuart. An uncharacteristic mistake in Race 3 by both Richie Ryan and Peter Moloney presented a victory for Charles Stuart. 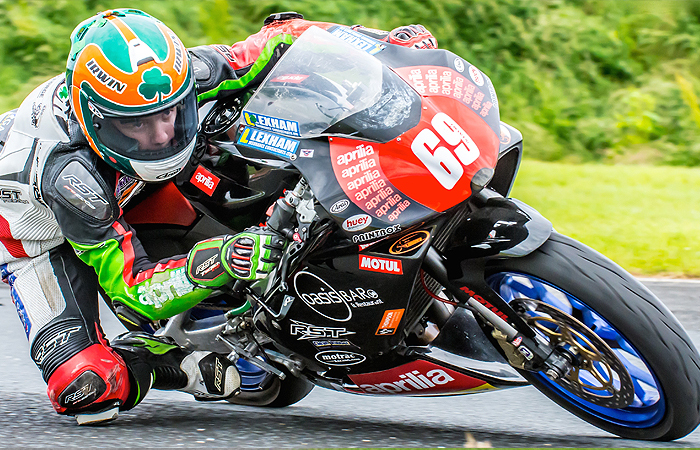 Mark O’Byrne running 3rd benefitted well by coming home in 2nd as Superbike veteran Paul Barron finished 3rd. Richie will have done his title chances no harm even with the DNF and hopefully Brian McCormack will be back sooner rather than later after his off while leading Race 2. Race 1 and 2 went to Eddie Healy in the Cup class as 2nd place went to Raymond O’Neill. In Race 1, Frank Doherty took 3rd with Michael Gillan claiming 3rd in Race 2. Eddie Healy also won the third race but, was placed in 3rd for the Pro class for his efforts. Michael Gillan gathered more points in 2nd place with Raymond O’Neill, having a solid weekend with 3rd place. Jason Lynn had a mixed qualifying session by setting pole position and then slipping off. 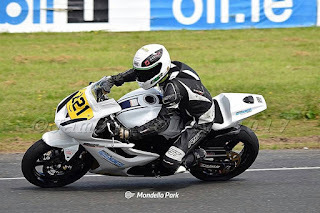 His team made a fine effort in repairing the bike and Jason repaid their hard work by taking Race 1 with commanding lead from Ross Patterson and Eunan McGlinchey. In the restarted Race 3, Jason Lynn won after Patterson slid off allowing Aaron Clifford to grab 2nd place in a drag race with Dean McMaster. Race 3 was won by Ross Patterson who led from start to finish from Jason with Dean McMaster grabbing another 3rd place. Jason will have a lead in the Championship following the weekend but, there’s still a long, long way to go! First win for Graham Whitmore in Race 2 from Luke O’Higgins and Michael Browne. Race 1 went the way of Eunan McGlinchey, Kevin Baker and Graham Whitmore took third. In Race 3, Eunan McGlinchey returned to the top step after a DNF in Race 2 as Luke O’Higgins claimed another 2nd place with Michael Browne recording another credible 3rd position. Eunan will have to keep his consistency going with the likes of Luke O’Higgins knocking on the door and capitalizing on any errors made. The pre-injection championship is currently between Joe Grant and Darryl Sharkey with Joe leading. Alan Kenny won both race 1 and 2, setting a new laptime in Race 2. Darryl made the most on these races with two 2nd places from Ian Prendergast and Joe Grant to narrow the gap at the top. Alan Kenny continued his winning form winning Race 3 as Darryl Sharkey closed the championship lead with a third 2nd place. Ian Prendergast completed the podium with 3rd in Race 3. The table will look a lot different when all of the points are tallied up. Jason Cassells is leading the Lightweight Supersport championship and extended this lead with a 2nd place in Race 1 and 2 as Rhys Irwin took the two wins. Race 1’s 3rd place went to Jacque Foley and Race 2’s to David Ging. Cassells also took 2nd in Race 3 from Rhys Irwin, with Slane MaGuire completing the podium in 3rd. John Ella entered his GP250 bike and won all 3 races taking the battle to Ducati rider Brian Murphy on the 888 who finished 2nd in Race 1, 2 and 3. David Murran was 3rd in Race 1 and Race 2. Des Butler took 3rd place in Race 3. There’s a wonderful variety of machines in this class that generates lots of interest for those of us that remember these bikes from our youth. Would love to see a greater number of bikes in the Classic Superbike grids going forward, and as for the noise! 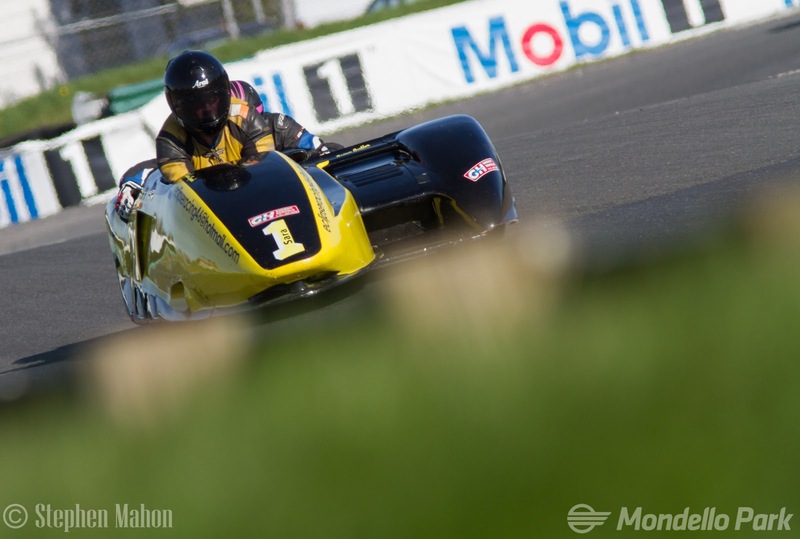 Dylan Lynch and Dave Butler are enjoying many successes in the Sidecar championship, winning Race 1, 2 and 3 with a considerable. Dave comfortably leads the passenger championship while Dylan is also looking good in the drivers table. Fergus Woodlock has thrown down a marker and picked up three 2nd places over the weekend with the other three podiums going to the combinations of Mark Codd\Liam Gordon in Race 1 and Scooby Killough\Eamon Mulholland getting 3rd in Race 2 and 3. Such are the level of entries at the minute that ‘B’ races are now ran at every Masters round. The lap times by the ‘B’ riders in SBK and SSP are still quite competitive. 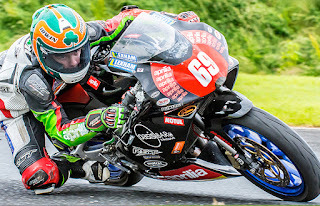 In the Supersport races, it was a mix of podiums for Ian O’Connor, Trevor Foran and Chris O’Mahony. Ian won Race 1 from Trevor and Chris. O’Connor also won Race 2 from Chris O’Mahony and John Kavanagh. Race 3 was similar to Race 1 win Ian O’Connor winning again but, in this instance, Chris O’ Mahony was 2nd and Trevor Foran 3rd. 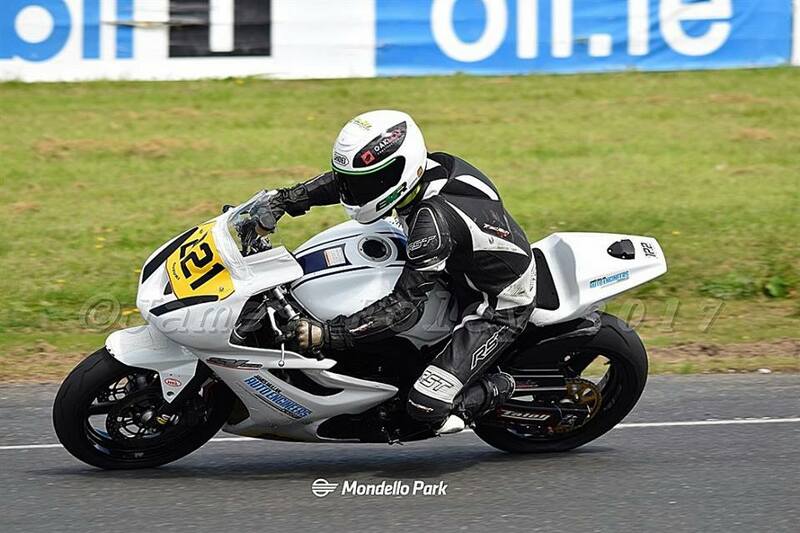 In the SBK races there were wins for Richard McLoughlin in Race 1 and John Griffin, who won both Race 2 and 3. Race 1’s podium was completed by Robert Toner in 2nd and Kevin Maher in 3rd. Maher was also 2nd in Race 2 from John Cahill in 3rd. In Race 3, Anthony Derrane upped the ante for 2nd place with John Cahill in 3rd. 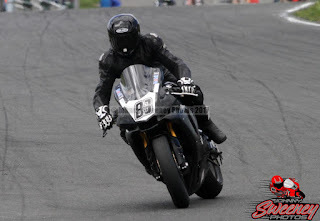 A fine weekends racing in the Supertwins category saw wins for Dave Butler and Derek Wilson. Butler won Race 1 and 2 but, Wilson fought back to win Race 3. The rest of the podiums went to Simon Reid with a 2nd in Race 1 and Liam Chawke with two 3rd places. Still nip and tuck between Butler and Wilson in the points though at the halfway point of the season. 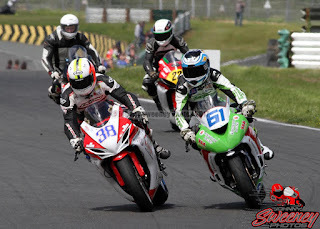 Eunan McGlinchey looked quite at home as he stood on the top step for the three Production twins races in front of Jason Cash and Shane Sweeney this weekend. Shane O’Donovan also grabbed a 3rd place in Race 1 with a quality ride. For most of the weekend, McGlinchey was on the coat tails of the Supertwins train and is a real fly in the ointment for these guys when sharing the grid. Makes for entertaining viewing for the spectators for sure! Ryan Desmond collected the 3 wins from the 3 races at the weekend adding nicely to his points lead in the table. Donal O’Donovan, Oisin Maher and Dylan Fitzsimons kept the pressure on him though as they recorded podium finishes. In race 1, Oisin was 2nd and Donal 3rd. In Race 2 O’Donovan moved up one spot to 2nd while Dylan Fitzsimons was 3rd. Race 3 also saw Oisin take 2nd place from Donal O’Donovan in 3rd. A small error from Brendan Glover in Race 1 saw Nathan McGauran take full advantage and secured the Saturday win. Glover made sure this wasn’t to be the case for the weekend however, and bounced back to take the wins in Race 2 and 3 consolidating his position at the top of the Young Guns table.